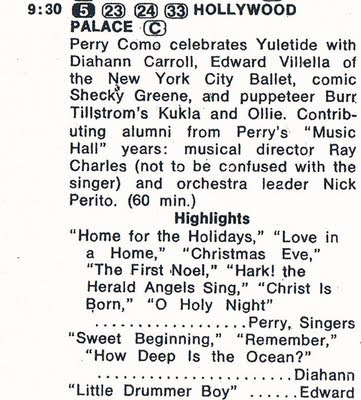 And alas, this was to be the last Christmas "Hollywood Palace"; in less than two months, on Feb. 7, 1970, the program's run came to an end after six years. It did, however, last considerably longer than the program that previously originated from that same theatre (known during this show's run as the ABC Palace Theatre): the very ill-fated two-hour talk/variety series "The Jerry Lewis Show." That layout of TV listings in TV Guide (heavy on two weights of Helvetica), B.T.W., was first unveiled in the May 31-June 6, 1969 issue. (Certainly with two editions I have in my collection, New York-Metropolitan and Scranton-Wilkes Barre.) I'd call the 1969-72 variant my favorite (that is, after the change from (C) to (BW) in August 1972, but before they switched from hot-metal Linotype to phototypesetting).